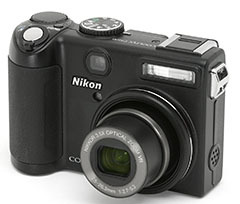 Nikon has released the Coolpix P5100 just six months after the P5000 received positive reviews. Essentially, this is Nikon's high-end compact for serious photographers who want a capable point and shoot to augment their DSLR. Many of its specs will look familiar to those of you who have been eyeing Canon's PowerShot G9: 12 Megapixels on a 1/1.8 CCD, optical image stabilization, 3.5X zoom, SDHC card compatibility, face detection, 2.5" LCD monitor, and all the settings any serious photographer would want. I think the P5100 is a smarter looking camera than its predecessor, going more with the matt black look instead of the mix of chrome and black. Invariably, though, we all want to see how it stacks up to the Canon PowerShot G9. I've just returned from two weeks in the Caribbean using the G9 as one of my cameras, and it performed admirably. But the things I liked about it are missing from Nikon's P5100--notably the longer 6X optical zoom lens and RAW mode. Plus with the Canon you get a 3" LCD vs. the P5100's 2.5 monitor. So when DPReview published their review of the Nikon P5100, I was eager to see if their thoughts were similar to mine. In short, yes, they were. One of Richard Butler and Simon Joinson's primary complaints with the P5100 is that Nikon didn't really improve its handling speed. This is something they noted about the G9 too, although I have been fairly happy with its start-up and shutter lag performance. What the G9 doesn't have, as well as the P5100, is any sort of useful burst mode compared to a DSLR. But where things really get interesting is the comparison of images shot at the lowest ISOs and ISO 400. My eyes see a clear difference with the G9 images looking hands down better. The reviewers seem to soften their comments here, but the pictures really tell the story. Overall, even if you're a Nikon shooter, I think you should consider the Canon G9 as your high end compact. The Canon does cost $100 more, but that's about the only mark against it for a "pro point and shoot." For me, this is one of those many instances where you have to ignore brand and go with the better camera. With a point and shoot, is there any real downside to going with the best camera, regardless of brand? It's not like an SLR where you have to think about lens compatibility etc. I like my Nikon dSLR, but I can't see a good reason not to get a Canon point and shoot (or a Panasonic or Sony, for that matter). I think that's it exactly Travis. You don't have the lens compatibility thing to worry about, so why not? So far, I'm really glad I upgraded to the G9 from G7. You are over looking the fact that the Nikon can take video for as long as you have space on your card. The Canon can not which I feel is a downfall especially if this is your second camera. I have never used a point and shoot camera for video (thats what video cameras are for). I read all the expert reviews of the 5100. Most were pretty critical. Interestingly, most of the user reviews are very positive. I owned the G7. In a word, it was horrible. Autofocus was terrible. Images ranged from blurry to soft. It was hard to get a decent image. On top of that, the G7 was a brick. It certainly wasn't pocketable, so why not just carry my D40? The G7's ISO wheel is a joke. The settings on it should read ISO 80, ISO 100, Blurry, Blurrier, and Sh*tty. I can't imagine the G9 being much better. The 5100 takes very good pictures for what it is...a pocketable alternative to your DSLR. Is it slow? Yes. But it takes sharp, beautiful images with natural colors and that's all I can ask. I am not in a tremendous hurry taking pictures. If it takes a few seconds to write the image, fine. I admit, I can only compare the 5100 to the G7. 5100 wins hands down. "And thus, like the G7 before it, the G9 is a wonderfully built and designed camera, but one that simply cannot (nor could ever) really deliver on its promises; it truly is a sheep in wolves' clothing. By all means buy one (I would - it makes 99% of other compacts look like toys, and it's not like you can get significantly better image quality anywhere else), but do so in the full knowledge that a lot of what you're paying is for the icing, not the cake." Icing and no cake for $500? No thanks. ~I would not buy the G9 simply because of the many hundreds of people who have had a problem with dust getting between the sensor and the lenses, after just a few weeks use. Most reviews are neglectful of that fact, or, as is the case above, the reviwer has only been using the camera for a couple of weeks. A large percentage of the Canon g9's have become unusable because of this issue. I would not expect that on such a high end expensive camera. Frankly its disgusting. Thanks but no thanks Canon.